The crematorium at the Terezín Jewish Cemetery was built by ghetto prisoners by order of the SS commanders. Its operation was launched at the beginning of October 1942. The central part of the facility comprised four oil-powered incinerators supplied by Ignis Hüttenbau from Teplice-Šanov. The front section served as a space for unloading the corpses from coffins. 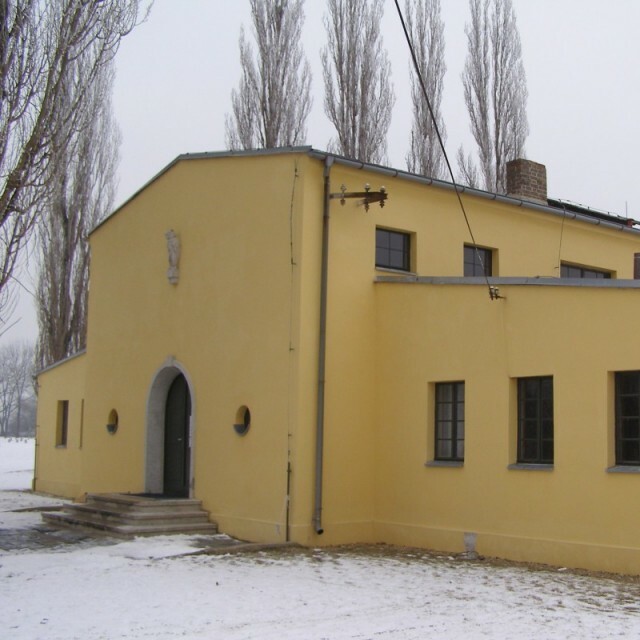 On one side it bordered with the autopsy room, on the other there was an annex that housed the guards made up of Czech police officers and prisoners working at the crematorium. At the time of the highest mortality rate, there were up to eighteen prisoner workers who rotated in permanent shifts. Whenever the mortality rate dropped, the number of workers decreased to four. The crematorium was supervised by SS-Scharführer Heindl, one of the camp's feared top officers, yet routine checks were carried out by the camp commanders as well. Corpses were placed in the incinerators without coffins, resting only on the bottom board they were attached to. This meant that the coffin lids could be used repeatedly. Autopsies were conducted on some of the bodies before cremation so that imprisoned doctors could determine the cause of death in case it was not clear. Workers operating the incinerators tried to get all the human remains out individually and place them properly in the urns. An especially difficult task, some had to pick out fragments of gold from the ashes and broken dentures, and hand them to the SS oficers. Cremation records were kept in daily logs; each urn listed basic information about the deceased that were copied from a card attached to the foot of the deceased. They included the name, transport number and cremation number. Urns were first stored in the back section of the crematorium and then transported to the columbarium, located in the casemates of the fortification embankment opposite the funeral ceremony rooms and the central mortuary. Thousands of urns were placed in shelves there, as SS officers wanted to make the prisoners believe that the remains would receive proper burial after the war. It was not only victims from the ghetto who were cremated here. Dead prisoners from the nearby police prison of the Small Fortress were also brought to the crematorium. Prison guards accompanying the transport supervised these cremations and were careful not to let the prisoners working at the crematorium catch a glimpse of the bodies. However, blood seeping from the coffins and sacks holding the bodies was clear evidence of the fact that the victims died a violent death. From 1944 - 1945, the crematorium also burned dead bodies from the Litoměřice concentration camp that had a high mortality due to horrifying working conditions and epidemics. From the beginning of April 1945 the concentration camp started using its own crematorium. Records kept by the crematorium workers noted approx. 30,000 victims, cremated from 1942 to 1945.